Lets face it! There are stupid mistakes, and most of them are repeated time after time. At least I do it ! Luckily you will gradually learn to check the most common causes before panicing and causing more severe mistakes than the original one. Here are a list of the most common and "stupid" problems I have faced while working with Arduino. Actually I have been lucky and I have never broke any arduino board by causing short circuits etc. I think the reason is that I am always using RED wire for the power and BLACK wire to the ground. And I never ever use these wires to connect data ports. I have also learned to CONNECT FIRST ALL GROUND WIRES before connecting anything else. Possibility to have some kind of voltage peaks while connecting the circuit to the power source is diminished. One weird error happened once with my robot - it started to move by itself when I put my hand near it!! It took some time to figure out the reason. My robots have two arduino board that are connected together. 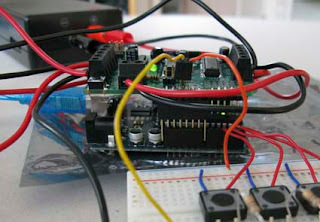 The first arduino was controlling the motors and the second one was handling all the communications and data from sensors. Obviously the data signal that commanded first arduino to steer motors was floating. When I approached the robot, the state of that data signal changed due to my capacitive load I was introducing to the circuit. The reason was naturally as simple as that these two aduino boards did not had a common ground. The correction was easy. I just connected all the ground signals to one common ground. Since this, I have remembered to check that my circuit will allways have only one common ground. The lesson was learned. - Are you sure that you have correct memory card in the MP3 player? - Are you sure that you have turned the loudspeaker on? - If you use serial connection : are the RX and TX signals cross-connected? the RX port of the arduino should be connected to the TX port of the MP3 player, and vice versa. - Have you renamed your files in PC having Windows operating system? Windows may add EXTRA suffix at the end of the file without showing it!! You may think that name of your file is for example TRAC0001.MP3 but actually it is TRAC0001.MP3.MP3. In this case the MP3 player will not recognize the file. I have learned to check the filenames by using MS-DOS/Windows promt before moving them to the memory card.